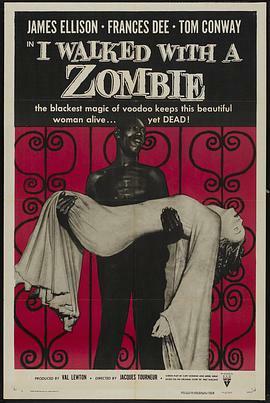 A Hollywood primordialexploration of the now time-honored zombie trope, running around a svelte 69-minute and with the filmmaker who previously brings us CAT PEOPLE (1942), I WALKED WITH A ZOMBIE holds its own in its compact narrative that takes place in theCaribbean island of Saint Sebastian, where the wife of a sugar plantation owner has slumped into a zombie-like state, viz. a living dead under the spell of voodoo magic. Audience are whisked onto the tropical land with our heroine, a Canadian nurse Betsy Connell (Dee), who snatches the well-paid job to minister to the aforementioned wife Jessica Holland (Gordon), whose first apparitional appearance is a mild hair-raiser, and instinctively swoons for her hubby, Paul Holland (Conway), a suave gent ailed by a pessimistic streak, the first thing he tells her is that "everything is putrescent”. As she dedicatedly takes it on herself to bring Jessica back to the living world, a manifestation of her lofty affection to the man she loves, and is out of step with a more plausible self-serving/possessive maneuver that more likely pops up in the context of romantic pursuit, her last resort to work the miracle hinges on the local voodooism, and the most atmospherically stirring sequence is where she chaperones a sleep-walking Jessica across a nocturnal cane field interspersed with memento mori, to attend an occult ceremony and is appalled by the sight of a dead-fish-eyed guardian Carrefour (Jones), an archetypal zombie embodiment that might give viewers at then nightmares. DirecterJacques Tourneur, cunningly straddles the explanation between scientific diagnosis and ethnic necromancy, also configuresa bare-bones JANE EYRE plot to leaven the narrative, although Frances Dee flourishes as a gamely virtuous can-doer, and theater dab-hand Edith Barrett upstages the rest with a layered rendition as Mrs. Rand, Paul’s mother, whose evasive culprit identity actually counterpoints her palpable bonhomie, the film per se is too much an obsolete novelty to be seriously reckoned as a masterwork, not even with the help of Sir Lancelot’s calypso invention, especially when he is unceremoniously introduced as a Janus-faced fabulist (apologizing first, scandal-disclosing later).